1US democracy is currently in crisis simultaneously on several fronts. Americans’ civil liberties are seriously compromised by the US Patriot Act that was hastily adopted by Congress in October 2001 in a panicked response to the attacks of 9/11. Other rights, including habeas corpus, that were formerly guaranteed by the Constitution, have been put in jeopardy by Attorney General Ashcroft.1 Elected officials, including the President, who swore an oath to protect and defend the Constitution, have openly attacked portions of it and perversely interpreted other portions. Un-elected officials in Bush’s cabinet are redefining our relationship to Europe and other parts of the world. And all of this is occurring in an administration the legitimacy of whose election remains questionable. Since debate is essential to the vitality of constitutional democracies, perhaps it will not seem gratuitous to single out this aspect of the US democratic crisis as in many ways fundamental to the others. 2To speak about a crisis of debate in one’s own country when one is not at home is difficult enough, but to do so in a time of war, perhaps of indefinitely continuing war, is particularly problematic for at least two reasons. 4Furthermore, war is, he says, “chameleon-like in character,” because it changes its color in each particular case and because it is composed of what he calls “a wonderful trinity” of elements. Those are (1) blind instinct (that is, hatred and animosity), (2) probabilities or chance, and (3) the instrumentation of politics. It is only in this last element (its political sphere) that war, he thinks, can be grasped by reason. That is why all arguments based on military expediency are suspect. No military argument is above suspicion (or so Clausewitz argues), because there are no military arguments, only political ones. Each element in this trinity, however, has its particular constituency. Hatred and animosity are necessary for the people at large if there is to be war. The play of probabilities and chance are more the concern of the generals and their armies. The political instrument, assuming it retains its credibility and authority, is the concern of the government. 5Because war is always subject to chance, there are no reliable calculations in the art of war. Instead, Clausewitz claims, “from the outset there is a play of possibilities, probabilities, good and bad luck, which spreads with all the coarse and fine threads of its web.” For example, there is unpredictable weather here, a new weapon there, a sudden alliance or secret intelligence, an unanticipated strength of resistance, a surprisingly detected weakness, or an unexpected move. Finally, it is difficult to think about war because the complexity of the human element is always just beyond reason itself: “There is therefore everywhere a margin for the accidental, and just as much in the greatest things as in the smallest.” Even as Foucault, when he wrote about madness, was compelling reason to reach out to comprehend its other, its opposite, so Clausewitz saw as a compelling, but perhaps in the end an impossible, stretch of reason in the challenge to think of war. 6If the first reason this topic is difficult to address is that it lies just beyond reason, the second is that information is constantly changing and often unreliable. For example, until the middle of March 2003 there was virtually no significant public debate in America about war with Iraq. Neither congressional members of the Democratic Party nor the news media were fulfilling their traditional obligations to be critically reflective concerning government policy, apparently because of the continuing effects of the 9/11 terrorist attacks (which included the threat of more attacks, the restrictions of the Patriot Act, and the unresolved mourning for the dead and for the loss of security), as well as the efforts by members of the Bush administration to brand dissent as unpatriotic. But as it became clearer that Bush had no intention in the first place of averting war, opposition on a significant scale suddenly erupted just before attacks on Iraq began. There were major demonstrations in New York, Washington, and San Francisco (as well as elsewhere around the world); most of the mainline US churches (especially the Methodists, Episcopalians, Lutherans, and Roman Catholics) came out publicly against war, arguing, as former President Jimmy Carter did in an eloquent op-ed piece in The New York Times, that war with Iraq did not meet the classical Christian criteria for a just war3; PBS television and NPR began to carry full debates on various aspects of the war; and protests, vigils, and teach-ins began to occur on many college and university campuses. If the problem a few weeks before the war began was the absence of dissent and debate, as soon as the war started the problem became how to conduct debate rationally, especially given the problems that Clausewitz articulated 170 years ago, and given also the problem of strict control on military and other information by the US government. 7The Bush administration displayed its unintentionally revealing but nonetheless tin ear for metaphor by using the term “embedded” to refer to the procedure of placing journalists within military units, as though a microscopic access to battlefield information were an acceptable substitute for informed discussion and debate. (We have in the States the saying, “Politics makes strange bedfellows,” which is quite certainly not what the Bush administration wanted associated with its embedding policy.) While embedded journalism may provide action ground footage for CNN by the hour, it provides no critical perspective on the war, which it appears to have been designed to prevent. It is a rare journalist who can critically distance himself from the troops he is living with night and day, as he relies on them for his very survival. Furthermore, has there ever been a general who has given his foot-soldiers an over all sense of strategy? The journalists were precisely where they were likely to have little coherent critical sense of how the war was being waged. Nevertheless, the remarkable technology now available facilitated instant communication among these journalists – embedded or not – and produced some remarkable pictures that have appeared on television around the world even as ground assaults, injuries, rescues, and other events were occurring. The problem here is not that the world lacked eyes on the battlefield; rather, it is that the essential element in public debate – which is critical perspective – was in terribly short supply, especially, as on CNN, where the ground coverage was most intense. 9Beside this, Mr. Secretary Rumsfeld seems, incredibly, to be the essence of candor. While these remarks of Jefferson’s may, of course, be simply good advice about how to debate effectively (saying little but at the key moment), there is here also the tone and attitude of an 18th century aristocrat of Virginia who finds debate something that must be endured, rather than an essential ingredient in a democratic process that can resolve disputes and arrive at consensus, which, of course is literally a thinking together. Jefferson’s is one of those exquisite, noble minds who is more concerned about imposing his ideas on his neighbor than being imposed upon himself. Freedom for him seems always to imply a respect for distance and privacy. It presupposes the spacious geography of the new world of the 18th century rather than the civic intimacy of Athens or Paris or New York. 5 Peter Gay, The Enlightenment : An Interpretation (New York : Norton, 1969), I.1. 10An important link between Jefferson and Habermas that makes the one reluctantly tolerate debate and the other champion it is their mutual investment in the project of the Enlightenment. Peter Gay, in his magisterial history of the Enlightenment, is right to remind us both of the multiplicity of the Enlightenment and of its central focus. “There were many philosophes in the eighteenth century,” he writes, “but there was only one Enlightenment. A loose, informal wholly unorganized coalition of cultural critics, religious skeptics, and political reformers from Edinburgh to Naples, Paris to Berlin, Boston to Philadelphia, the philosophes made up a clamorous chorus, and there were some discordant voices among them, but what is striking is their general harmony, not their occasional discord.”5 It is virtually impossible to separate the idea of a deliberative democracy in which open rational debate is central from the project of the Enlightenment. 11The best description of that general harmony (or central focus) of the Enlightenment was written by the British intellectual historian Isaiah Berlin.6 The reason it is possible to think of the Enlightenment as a single project, Berlin declared, is that there was a widespread conviction that the natural world was a single whole subject to a common set of laws that human intelligence could discover; that those same laws that governed plants and animals also governed inanimate nature; that the identity of human beings is not fixed for all time but is capable of improvement; that there is a common set of goals that all human beings pursue, such as happiness, knowledge, justice, virtue, and liberty; that these goals are attainable, but that human misery is a consequence of ignorance of them or of the means of attaining them; that the eventual discovery of the laws that determine human behavior will make it possible to create a human society that is rational, happy, and just. In other words, rational human intelligence can (and should) produce a reasonable and good society. 12But how can it do that without vigorous public debate? One of the most remarkable things about the current conditions of public debate in America is that the major book publishers have responsibly filled the gap left by the paucity of effective journalism and the abdication of dialogic responsibility by the opposition party in the Congress. But it is also ironic that two of the most important and most revealing books concerning the recent, continuing war have come from writers who declare themselves to be conservatives: Andrew Bacevich and Kenneth Pollock. Nevertheless, both of them have gone out of their way in their thoughtful and timely books to work to restore the viability of public debate. 7 American Empire (Cambridge, MA : Harvard University Press), p. 43-6. 15In other words, the rest of the world must learn to submit to the hegemony of the only superpower that exists, the US. Given such a policy, recent hostility by the US to Europe, China, Russia, and the UN follows naturally and inevitably, especially when they challenge our claim to unquestionable supremacy. Indeed, this is precisely what has happened in the few months since the publication of Bacevich’s book. 17Bacevich goes on to confess candidly that by virtue of his military experience and family background, he identifies with the former group. Compared with the sins it opposed, he believes, the sins the US committed during the Cold War were simply “venial.” Although obviously no leftist radical, Bacevich is, nonetheless, greatly concerned about the direction US foreign policy has been taking since the fall of the Soviet Union and the Berlin Wall. This is the reason his book is so disturbing; even though it is not intended as either an indictment or a celebration of US policy, it is, nonetheless, a sober, conservative reflection on what he sees as the clear trajectory of US foreign policy through three administrations. 18This is a policy that cannot help but commit the US to continuous military activity around the world for the foreseeable future. By design and intent, this book is a conservative’s wake-up call to an American public that risks becoming even more complacent now that the current war appears to be winding down. But despite his startling message, Bacevich is the master of understatement, which makes his cool prose even more unsettling to read. American Empire is also an important achievement because it responsibly maintains the essential terms of rational debate: its arguments are carefully advanced; it doesn’t demonize its opponents; it is scholarly in its handling of facts and in its citation of sources; it respects its readers and allows for the possibility that they may disagree (as for example about US venial sins during the Cold War.) Indeed, this book is a sign that the stifling of public debate in the lead-up to the Iraq War had an unintended positive result. The abdication of responsibility to sustain democratic debate in the Congress and in the press has led to its redirection into major book publications by both conservative and liberal scholars. Furthermore, these books concerning the direction of US foreign policy and the war in Iraq have been flowing from some of the nation’s top commercial and academic publishers. 19Books such as this one (along with Kenneth Pollack’s The Threatening Storm,) both by university professors, put the lie to those who claim that there is no legitimate dissent from the right possible in the academic world on matters of US national policy. What is happening, in fact, is that multisided dissent is now emerging against US policy, as it did also during the disastrous pursuit of our foreign policy in Indochina 40 years ago. 20Bachevich’s principal warning is that the US policy of global “openness”, while sounding very appealing, is in fact very dangerous. The purpose of this policy, he insists, is “to expand an American imperium.”9 Removing 150 barriers that inhibit the movement of goods, as well as other forms of capital, including ideas and people, in order to achieve the ultimate objective of creating a new global order based on democratic capitalism is not likely to arouse much opposition in the American electorate. But it should because of the consequence of the accompanying essential proposition that the US is to be the ultimate guarantor of this new order and the enforcer worldwide of its norms, a consequence that is rarely faced by the American public, especially in terms of the military costs in lives, money, and lost diplomatic opportunity. 21The other book that I want to celebrate here, while abhorring its conclusions (as I do those in the Bacevich book) is Pollock’s The Threatening Storm, which was also published in 2002, filling a huge gap in public debate in the US at that time because until his book appeared there had been no reasoned open advocacy of the politics of a preemptive invasion. 10 The Threatening Storm : The Case for Invading Iraq (New York : Random House, 2002), p. XIV. 24For those especially, like myself, who were against a preemptive invasion, Pollack offered an important opening into the corridors of power where such decisions are made. Currently director of research at the Saban Center for Middle East Policy at the Brookings Institution, he is a graduate of Yale and a recipient of a Ph.D. in political science from MIT. During his time as director for Gulf affairs at the National Security Council (1995-1996 and 1999-2001), he was the principal official in charge of implementing US policy toward Iraq. Before his time in the Clinton administration, he worked for 7 years as a Persian Gulf military analyst for the CIA, where he was virtually alone in predicting Iraq’s invasion of Kuwait in 1990. 25At that time he witnessed, he says, US policy makers assuming that if we did nothing, Hussein would act reasonably. This was a mistaken product of what he calls “mirror-imaging,” “assuming that Saddam would think as they would if they were in his shoes.”11 Furthermore, he believes this was the major cause of poor policy choices concerning Iraq over the last 20 years. In short, he makes it clear that US policy is a major cause of our present difficulties in dealing with Iraq. Obviously, he is no jingoistic ideologue. 26Pollack has two analogies for our current situation with regard to Iraq. (1) He believes that France and Britain had a missed opportunity in 1938 to stop Hitler, and had they done so the war that began a year later wouldn’t have been so bloody. (2) He believes that US delay when faced with early warnings (his own especially) about the 1990 Iraqi invasion of Kuwait might have averted the (first) Gulf War. As always with analogies, there are as many differences to contemplate as similarities. 27What I admire most about his book, nonetheless, is that Pollack has managed to write in a way that promotes open debate, especially at a time when it has been systematically foreclosed by the Bush administration. When there is so little of what passes for democratic dialogue in the Congress and in the press, it is mildly encouraging that at least the major publishing houses – the makers of books – in this case Random House, manage to sustain dialogue when others have so shamefully failed to do so. 28Pollack divides his book into three parts. Part one deals with the history of the relationship between the US and Iraq; part two describes the state of Iraq today; and part three lays out several policy options. It is a tribute to his honesty that he clearly marks his position – not whether but when – which enables his reader to remain critically reflective on the argument he unfolds. For those who opposed a preemptive war – at least in the current climatethis book was the most cogent argument on the other side that needed to be answered. For those who had made up their minds the other way, it was a model of civil discourse that kept dialogue open to opposing points of view, while never demonizing its opponents. At a time when key members of the President’s cabinet vilify whole countries (including our traditional allies) whose leaders oppose our policy toward Iraq, the conditions of public, civil debate need to be affirmed. It is to Pollack’s credit that he does precisely that. 30I remain hopeful (what else can one be?) that Habermas’ conclusion is right, that the resources of a free and open political culture “emerge and regenerate themselves spontaneously for the most part” and that they will prove, in the end, always difficult if not impossible to repress. 1 For a detailed account of the Patriot Act and its impact on political dissent, see Nancy Chang, Silencing Political Dissent (Seven Stories Press, 2002). 2 Carl von Clausewitz, On War, trans. F.N. Maude (London : Penguin, 1968), p. 120-1. What follows is a summary of Book II, Chapter II, p. 180-200. 4 Thomas Jefferson, Writings, ed. Merrill D. Peterson (New York : The Library of America, 1984), p. 52. 6 Isaiah Berlin, The Magus of the North : J.G. Hamann and the Origins of Modern Irrationalism (London : John Murray, 1993), p. 27-28. 12 Jürgen Habermas, « Three Normative Models of Democracy », in The Inclusion of the Other : Studies in Political Theory, ed. Ciaran Cronin and Pablo De Greiff (Cambridge, MA : MIT Press, 2001), p. 247. 13 For a lucid and detailed discussion of this reversal, see Robert Kagan, Of Paradise and Power : America and Europe in the New World Order (New York : Knopf, 2003). PAYNE, Michael. 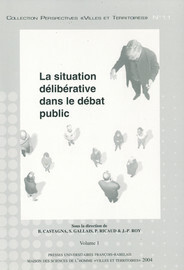 Habermas’ Deliberative Politics and the Current Crisis in US Democracy In : La situation délibérative dans le débat public : Volume 1 et 2 [en ligne]. Tours : Presses universitaires François-Rabelais, 2004 (généré le 20 avril 2019). Disponible sur Internet : <http://books.openedition.org/pufr/7133>. ISBN : 9782869065000. DOI : 10.4000/books.pufr.7133. Payne, Michael. “Habermas’ Deliberative Politics and the Current Crisis in US Democracy”. Castagna, Bernard, et al.. La situation délibérative dans le débat public : Volume 1 et 2. Tours : Presses universitaires François-Rabelais, 2004. (pp. 143-153 -Vol. 1) Web. <http://books.openedition.org/pufr/7133>.